Does Your Billboard Design Have What It Takes? Today we are going to look at an example of the most common forms of outdoor advertising: billboard design. While billboard advertising in Orange County and the Inland Empire is often not the first choice among advertisers, it should be considered, especially if it’s done creatively and intelligently. Large and prominently placed, effective restaurant billboard design can reap huge dividends if you can grab the attention and imagination of your audience. Abuelo’s is a small Mexican restaurant chain headquartered in Lubbock, Texas that has grown to 30+ locations. What is clear when you visit their website is that they have grown because they have focused on the quality of their product and its presentation. Basically, it’s all about the food. And that’s the kind of restaurant that can get people talking in a hurry. Especially if the marketing director of a restaurant understands the need to promote that product in deliciously delectable ways. At first you may not consider it to be anything special or unique as far as billboard design goes. But consider how they edit and choose. Three words…that is all they used for text: Extraordinary Mexican Food. 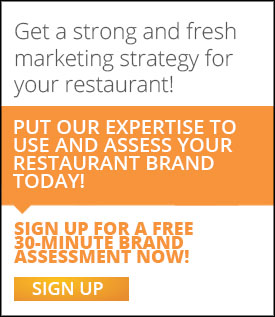 How many restaurant marketing directors do you know that can sum up their restaurant in three words? And where do they place that phrase? Right over their name. And knowing that we all read left to right and are most likely traveling 65 mph on a freeway, they give you two food and drink images with simple destination directions right below. Also take note of the lack of hype. No exclamation points or starbursts here. Just a claim to be better than anything you’ve had before. Its simplicity makes it brilliant. And when you visit Abuelo’s Facebook page here, you can see that their branding has paid off. They have over 50,000 Facebook fans and it’s a constantly growing organic number. 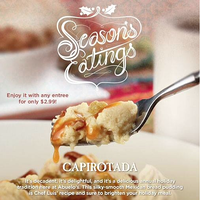 We love this holiday promotion of their bread pudding. How could you not want to find an Abuelo’s today?! Creating a great product is one thing. Knowing how to promote it is another. If you can do both you are going to grow quickly and reap huge benefits. With a simple clear message that is placed in a high traffic area, a well-designed restaurant billboard will serve your business well.